I have been enjoying the weekly reflections that are creating these posts and am very appreciative of the feedback received and the time taken by colleagues to check-in each week. Brandon (@AlwaysPrepped) has checked in and asked if I would write a blog for his site using this theme and with a technology angle. The timing could not have been better as my last week had a number of technology moments and served as a great reminder of the potential for so much more learning. George Couros (@gcouros) started the Leadership 2.0 initiative through Twitter with a stated purpose to create something similar to a Massive Open Online Course (MOOC) for leadership, He asked colleagues to help provide some of the nine sessions that will be taking place over nine consecutive weeks. Mine is coming up in two Tuesdays with the theme of “Understanding and Responding to the Larger Societal Context”. I’d love to hear from colleagues about their views as I prepare my session. 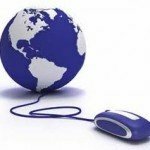 This open, online course is free to anyone who cares to participate and I have found the exchanges to be fascinating and the follow-up to be quite informative. I’m not sure I fully understand (or even remotely understand) the technology behind these Blackboard Collaborate sessions but I am amazed by the capacity they provide, as people from around the world gather to share their views. I have not met most of the facilitators of the sessions but feel like I know lots about them from participating. With the amount of travelling I do, I am always looking for ways to stay connected with family, friends, and clients. I enjoy using Skype and iChat to link up and consider them (generally) to be better than the phone of days gone by. As my oldest granddaughter approached her third birthday, I know we will communicate more using this technology. The downside usually happens with some less than satisfactory hotel Internet service (and that’s a column on its own) resulting in a return to the phone connection. I also took advantage of iChat to connect with a school in Winnipeg while I was in San Francisco and then back home in Gibsons. We were able to lay out some good plans and then also discovered some flaws with the process, which we will address in time for me to present a session to the entire staff from the comforts of my home office. While I will always prefer the “in person” contact, I have found this approach to be helpful in laying some groundwork for subsequent work when I arrive. My final technology connection happened as I spent an extended period of time with my co-author Chris Weber (@Chi_educate) working through a couple of chapters on our next book. I remain in awe of the potential of the tools that allow us to share ideas, graphics, and tools while in the development process. Chris and I may not be in the same room until after the book draft has been completed and that is certainly a 2012 way of creating a book. I’m certainly no technophile and am likely more hesitant than most to get the new tools once they are released. I still enjoy the look on students’ faces when I tell them about a significant historical moment I experienced while listening to my transistor radio. Their complete amusement at my description of the small rectangular box I held to my ear while shifting directions to get better reception is a good reminder of the changes that have happened during my career as an educator. 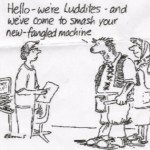 I look forward to becoming more technologically literate and am thankful for colleagues who have taken the leap first and are willing to share with reforming Luddites like myself.